Diponegoro (Mustahar; Antawirya; 11 November 1785 – 8 January 1855), also known as Dipanegara, was a Javanese prince who opposed the Dutch colonial rule. He played an important role in the Java War (1825-1830). In 1830, the Dutch exiled him to Makassar. Diponegoro was born on 11 November 1785 in Yogyakarta, and was the eldest son of Sultan Hamengkubuwono III of Yogyakarta. When the sultan died in 1814, Diponegoro was passed over for the succession to the throne in favor of his younger half brother who was supported by the Dutch. Being a devout Muslim, Diponegoro was alarmed by the relaxing of religious observance at his half brother’s court, as well as by the court’s pro-Dutch policy. When his half brother died, leaving only an infant son as heir, Diponegoro was again passed over, though he believed he had been promised the right to succeed his half brother. Dutch colonial rule was becoming unpopular by the local farmers because of tax rises, crop failures and by Javanese nobles because the Dutch colonial authorities deprived them of their right to lease land. Because the local farmers and many nobles were ready to support Diponegoro and because he believed that he had been chosen by divine powers to lead a rebellion against the Christian colonials, he started a holy war against the Dutch. Dipenogoro was widely believed to be the Ratu Adil, the Just Ruler predicted in the Pralembang Joyoboyo. The beginning of the war saw large losses on the side of the Dutch, due to their lack of coherent strategy and commitment in fighting Diponegoro’s guerrilla warfare. Ambushes were set up, and food supplies were denied to the Dutch troops. The Dutch finally committed themselves to controlling the spreading rebellion by increasing the number of troops and sending General De Kock to stop the insurgencies. De Kock developed a strategy of fortified camps (benteng) and mobile forces. Heavily-fortified and well-defended soldiers occupied key landmarks to limit the movement of Diponegoro’s troops while mobile forces tried to find and fight the rebels. From 1829, Diponegoro definitely lost the initiative and he was put in a defensive position. Many troops and leaders were defeated or deserted. When Sisingamangaraja XII was crowned the King Batak, this time he was only 19 years old. Until the year 1886, almost entire Sumatra already mastered the Netherlands except in Aceh and the Batak lands which are still in the situation of freedom and peace under the leadership of King Sisingamangaraja XII is still young. People’s farming and livestock breeding, hunting and a little trade. If King Sisingamangaraja XII visiting a country all the “terbeang” or captured, should be released. Sisingamangaraja XII’s famous anti-slavery, anti-oppression and would appreciate independence. Netherlands at that time still admit the Batak land as “De Onafhankelijke Bataklandan” (Batak Region that do not depend on the Dutch. Year 1837, the Dutch colonialists extinguish “Padri War” and paved the way for colonial rule in Minangkabau and South Tapanuli. Minangkabau fall into the hands of the Netherlands, following the Christmas area, Mandailing, Barumun, Kildare Alternating, Angkola, Sipirok, Beach Barus and Sibolga area. Therefore, since 1837, the Batak land was split into two parts, namely regions that have been seized by the Dutch into the country’s Gubernemen called “Residentie Tapanuli and Onderhoorigheden”, with a resident domiciled in Sibolga is administratively subordinate to the Governor of the Netherlands at the Padang. While other parts of the Batak land, ie areas Silindung, Pahae, Habinsaran, Dairi, Humbang, Toba Samosir, yet managed to remain dominated by the Dutch and the Dutch recognized as an independent Batak land, or ‘De Onafhankelijke Bataklandan’. In 1873, the Dutch declared war on Aceh, and troops landed on the shores of Aceh. At that time the Batak land where King Sisingamangaraja XII in power, still has not been colonized by the Dutch. But when three years later, in 1876, the Netherlands announced a “Regerings” Besluit Year 1876 “which states the Silindung / Tarutung and surrounding submitted to Dutch rule, and must submit to the Resident of the Netherlands in Sibolga, the atmosphere in the northern part of the Batak land into heat. King Sisingamangaraja XII that despite the clan, not from Silindung, but as King of kings who protect others around the Batak land, rose kegeramannya saw the Dutch began to annex the lands of the Batak. King Sisingamangaraja XII witted ploy Dutch strategy. When the Dutch began to annex Silindung, surely they will catch up with the annexed Humbang, Toba Samosir, Dairi and others. 3. Cooperate Batak and Acehnese to equally against the Dutch. Seen from this event, who Sisingamangaraja XII with ferocious zeal, declared war against the Dutch who wanted to colonize. It was found, Sisingamangaraja XII was not anti-religion. And look also, Sisingamangaraja XII in his day, was able to establish the principles and spirit of unity and other tribes. Year 1877, start of the famous Batak war, which lasted 30 years. Started in Stone Bahal, Humbang, a fierce battle raged for three decades, 30 years old. Dutch mobilize troops from Aceh Singkil, attacking people’s army led by King of the universe Sisingamangaraja XII. Dutch troops who had come to attack toward the Bakara, where the palace and the headquarters of the Stairs Stone Sisingamangaraja XII, Balige resistance and managed to get dihempang. Dutch change tactics, he invaded the region in the next round Balige to seize the bag in the area of logistics Sisingamangaraja XII Toba, henceforth entered blockade of Bakara. In 1882, almost the entire area has been dominated Balige Netherlands, while Laguboti still maintained by commanders such as Commander of the XII Sisingamangaraja Ompu Partahan Translated Hutapea. New year later Laguboti fell after the Dutch deployed a battalion of troops along the line fusiliers cannon. Year 1883, as he had feared much earlier by Sisingamangaraja XII, now turn to the Dutch annexed Toba. The next domino to be a large Dutch troops from Batavia (now Jakarta), landed on the beach Sibolga. Also deployed troops from the District Court. Sisingamangaraja XII King of the Netherlands in reply to attacks from the direction of Huta Balige Pardede. Both the naval forces of the Lake Toba, troops deployed Sisingamangaraja XII. Forty-Solu Bolon or ships, each 20 meters in length to transport troops and as many as 20 x 40 people 800 people rode so Balige. A great battle going on. In 1883, the Dutch really exert all his power and his generals Sisingamangaraja XII and also fought vigorously. That year, in almost all Batak land the Dutch troops had to endure from the advancing troops loyal to the struggle of King Sisingamangaraja XII. However, on August 12, 1883, Bakara, where the Palace and the Headquarters Sisingamangaraja XII successfully captured by Dutch troops. Sisingamangaraja XII resigned to the Dairi with his family and loyal troops, also joined the Commander-Commander of Acehnese and others. At that time, Mount Krakatoa erupted. Black cloud covering the Batak land. A bad address as if it came. Before this event, in critical situations, Sisingamangaraja XII tried to consolidate to expand the front of resistance. He visited the shavings, Tanah Karo, Simalungun for coordinating the struggle and resistance against the Dutch. In motion the struggle that so many stories about the supernatural powers of King Sisingamangaraja XII. Sisingamangaraja XII Resistance forces had widened and cried, but the Netherlands is also willing to take big risks, by continuing to bring in reinforcements from Batavia, Fort De Kok, Sibolga and Aceh. Barisan Marsuse also brought in the prisoners even trafficked from Java to become the bait ball and shield the Dutch troops. Tracker teams from Africa, also brought in to search for hiding Sisingamangaraja XII. Barisan tracker consists of the people of Senegal. By enemy forces Sisingamangaraja XII was nicknamed “The Ulu Gurbak Birong Na.” But the army continued to fight Sisingamangaraja XII. Commander Sarbut Tampubolon Butar attacked barracks in the Netherlands, the Netherlands was invaded Lintong and dealing with the King Ompu Babiat Situmorang. But the attack also Sisingamangaraja XII to Lintong Nihuta, Hutaraja, Simangarongsang, Huta Paung, Parsingguran and Pollung. Commander of the famous Sisingamangaraja XII Amandopang Manullang caught. And the character who became Special Advisor Parmalim King Sisingamangaraja XII, Teachers Somaling Pardede also captured the Dutch. This happened in 1889. In 1890, the Dutch formed special forces to attack Marechaussee Sisingamangaraja XII. In the early 20th century, the Dutch began to work in Aceh. In 1903, Commander Polim stop the resistance. But in Gayo, where King Sisingamangaraja XII never visited, the resistance was fierce. Come in from the Gayo Alas Dutch troops attacked Sisingamangaraja XII. In 1907, the Dutch army colonel named Tiger or Devil’s Brigade surrounded the Sisingamangaraja XII. Sisingamangaraja XII but not willing to surrender. He fight to the death. Boru Sagala, Wife Sisingamangaraja XII, Dutch troops captured. Participate caught Sisingamangaraja XII sons and daughters are still small. King Pufferfishes and Pangkilim. Following Boru’s mother Situmorang Sisingamangaraja XII was also arrested, following the Edit Mariam, daughter Sisingamangaraja XII and others. In 1907, on the edge of time Aek Sibulbulon, in a village whose name Si Onom Hudon, on the border of North Tapanuli and Dairi Regency is now, servants Sisingamangaraja XII by bullets Marsuse Netherlands led by Captain Christoffel. Sisingamangaraja XII died along with two sons and Patuan Patuan Nagari Lopian Anggi and his daughter. King allegedly bulletproof Sisingamangaraja XII died after a bullet hit his daughter’s blood spattered Lopian, who died in her lap. His followers split up and try to continue to fight, while the family who still live Sisingamangaraja XII imprisoned, humiliated and dinista, they too become victims of the struggle involved. Thus, without a known surrender, without wanting to negotiate with the occupiers, without ever being held, persistent, tenacious, militant, Raja Sisingamangaraja XII during 30 years, for three decades, has been struggling with a selfless spirit and love of the homeland and to its independence is not bertara . That is what is called “Spirit Juang Sisingamangaraja XII,” which need to inherited all the Indonesian people, especially the younger generation. Sisingamangaraja XII really a true patriot. He is not willing to sell the ground water for personal enjoyment. Before he died, was once the Dutch colonizers to offer peace to the King Sisingamangaraja XII in return for lucrative enough. Patriotism heavy ribbing. He was offered and promised to be appointed as the Sultan. If only the Dutch are willing to submit to authority. He will become King of the Batak land which would like to make peace. Van Daalen Dutch Governor who gave the offer even promised, will welcome the arrival of the King himself Sisingamangaraja XII with cannon fire 21 times, if willing to enter into the lap of the Netherlands, and will be given a position with great pleasure, so long as willing to compromise, but the King Sisingamangaraja XII firmly rejected. He is opinionated, it’s better than living on land berkalang clash colonizers. King Sisingamangaraja XII died on June 17, 1907, but his sacrifice was not in vain. And just 38 years later, the invaders really lift the foot from Indonesia. On August 17, 1945, the Indonesian independence was proclaimed Sukarno-Hatta. Tuanku Imam Bonjol (Born Knurl, Pasaman, West Sumatra, Indonesia 1772 – died in exile and was buried in Lotak, Pineleng , Minahasa, 6 November 1864) , is one cleric, Leaders and warriors who fought against Netherlands in the wars known as Padri War in the years 1803-1837 . Tuanku Imam Bonjol appointed Indonesia National Heroes based on Presidential Decree No. 1973 087/TK/Tahun , dated 6 November 1973[ 1 ]. The original name of Tuanku Imam Bonjol is Muhammad Shahab, who was born in Knurl in 1772. As scholars and local community leaders , he obtained several degrees , ie Peto Sharif, Malin Bases, and Tuanku Imam. Lord nan Renceh from Kamang as one of the leaders of Tiger nan Salapan is appointed Priest ( leader ) for the Padri in Bonjol . He finally better known as the Tuanku Imam Bonjol . can not be denied , Padri War leave at once heroic traumatic memories in the memory of the nation. For about 18 years old the first war ( 1803-1821 ) who fought a practical fellow Minang and Mandailing or Hobo general. At first occurrence of this war based on a desire among leaders in the clergy Pagaruyung Kingdom to implement and run the Shari’a Islam in accordance with Wahabi sect which time it developed in Arab lands (Saudi Arabia now) . Then the leader of the clergy who are members of Tiger nan Salapan request Tuanku Lintau to invite the King Pagaruyung Sultan Muning Alamsyah along Indigenous people to leave some habits that are not compatible with Islam . In some negotiations no agreement between The Padri ( naming for the clergy ) with Indigenous people. As it was in some Nagari Pagaruyung turmoil in the kingdom , and finally The Padri under the leadership of Tuanku Pasaman attack Pagaruyung in 1815 , and fighting broke out in SMART INVESTOR close Stone Cage. Sultan Muning Alamsyah forced to flee from the capital of the kingdom . 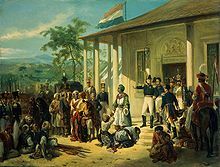 On February 21 1821, the Indigenous formally cooperate with the government Dutch East Indies fight against the Padri in the agreement that was signed in Padang , as compensation Netherlands obtained rights to access and control over territory darek ( inland Minangkabau )[ 2 ]. Agreement was also attended by the rest of the family dynasty Pagaruyung Kingdom under the command of Nature talisman Sultan Bagagar who have been in Field that time. Intervention Netherlands in that war marked by attack Simawang and Difficult Water by army Captain Captain Dienema Goffinet and early April 1821 on the orders of the Resident James du Puy in Padang . In this case VOC engage in war because of ” invited “by the indigenous . Resistance carried out by forces strong enough so that the priest is very difficult for them subject Netherlands . Therefore the Netherlands through the Governor -General Johannes van den Bosch invites leaders The Padri which time it has been led by the Tuanku Imam Bonjol to make peace with the intimation ” Agreements install a “ in 1824. This is understandable because while simultaneously Batavia also run out of funds in the face of another war in Europe and Java as Diponegoro War. But then this agreement is violated by the Dutch themselves by attacking Nagari Clever Sikek. However , since the beginning 1833 the war turned into a war between the Indigenous and the Padri against the Dutch , the two sides shoulder to shoulder against the Dutch , the original parties to the conflict finally unite against the Dutch . Tip of remorse appears consciousness, inviting the Dutch society in the conflict just miserable Minangkabau itself [ 3 ]. Merging of the indigenous and the Padri was started with compromise known as The peak plaque Pato in Broken Tabek which embodies the consensus Indigenous basandi Syarak , Syarak basandi Kitabullah ( Indigenous based on Religion , Religious based Kitabullah (Al – Quran) ) . Assault and siege of the fort by the Padri in Bonjol Netherlands from all directions for about six months (March 16 – August 17, 1837 )[ 4 ] led by the generals and the officers of the Netherlands , but the army is largely composed of indigenous peoples from various tribes , such as Java, Madura, Bugis, and Ambon. In the list of names of the Dutch army officer , Maj. Gen. Cochius there , Lt. Col. Bauer , sous Major , Captain Maclean , Lieutenant Van der Tak, Assistant First Lieutenant Steinmetz . and so on , but also terda [at the names Inlandsche (indigenous) as Captain Noto Prawiro Inlandsche Luitenant Prawiro in Logo , Karto Wongso Redjo Wiro , Prawiro Sentiko , Prawiro Brotto , and Merto Poero . There are 148 European officers , 36 native officers , 1103 soldiers of Europe , 4130 native troops , Sumenapsche hulptroepen hieronder begrepen ( auxiliary troops Sumenep , Madura ) . The attack on the fort began Bonjol Bugis people who are in the front of the defense attack Padri . From Batavia brought in extra forces kept the Dutch army , which on the date July 20 1837 The ship arrived with Perle in Padang , Captain Sinninghe , a number of people Europe and Africa, 1 Sergeant, 4 korporaals and 112 flankeurs. The latter refers to the African soldiers recruited by the Netherlands in the continent , the present state Ghana and Mali. They also called Sepoys and served in the Dutch army . After aid comes from Batavia , the Dutch began to resume the siege , and in subsequent periods , the position of Tuanku Imam Bonjol get more difficult , but she is still unwilling to surrender to the Dutch . So up to three times the Dutch to change his war commander to seize Bonjol , which is a small country with a fort from the surrounding clay surrounded by moats . Later on, August 16 1837, Fort Bonjol can be mastered after long siege . In the month of October 1837 , Tuanku Imam Bonjol invited to Palupuh to negotiate. Arriving at the place was immediately arrested and thrown into Cianjur, West Java. Then transferred to Ambon , and finally to Lotak , Minahasa, Near Manado. In the last place that he died on 8 November 1864. Tuanku Imam Bonjol buried at the exile . The struggle that has been done by the Tuanku Imam Bonjol can be appreciation will heroism in opposing colonialism[ 5 ], as an award from the Indonesian government that represents the people of Indonesia in general , was appointed Tuanku Imam Bonjol Indonesia National Heroes date 6 November 1973. Besides his name is also present in the public spaces of the nation as a street name , the name of the stadium , a university , even at USD 5000 output sheets Bank Indonesia 6 November 2001[ 6 ]. Tuanku Imam Bonjol ( TIB ) ( 1722-1864 ) , who was appointed as a national hero berdasarkam Presidential Decree No. 1973 087/TK/Tahun , 6 November 1973, was the main leader Padri War in West Sumatra ( 1803-1837 ), a persistent fight against the Dutch . During 62 years of independent Indonesia , the name of Tuanku Imam Bonjol present in the public space of the nation: as a street name , the name of the stadium , a university , even in sheet USD 5000 output of Bank Indonesia 6 November 2001. However , recently appeared petition , sued his heroism . TIB accused of violating human rights because it forces invaded Padri Batak Land (1816-1833) which killed ” millions ” of people in that region ( http://www.petitiononline . com / knurl / petition.html ) . Padri cruelty highlighted by the publication of books MO Parlindungan , Pongkinangolngolan Sinamabela degree Tuanku Rao : Hambali school of Islamic Terror in the Batak land , 1816-1833 ( 2006 ) ( first edition published in 1964 , which has been criticized Hamka , 1974 ) , later followed by Basyral Hamidy Harahap , Greget Tuanku Rao ( 2007 ) . Both authors , incidentally from the Batak land , describing the suffering of his ancestors and the Batak generally during the assault troops in the region 1816-1833 Padri Mandailing , Bakkara , and surrounding areas ( Tempo , October 2007 ) . The emergence of a correction in the recent history of Indonesia discourse raises criticism against the concept of a national hero . Intellectuals and academics , especially historians , is the most responsible party if the evaluation of the historical discourse that only resulted in the emergence of friction at the basic level has the potential to divide this nation . the academic end of the pen must be sharp , but the texts torehannya results should not contain ” hot air ” . That is why in the academic tradition , subjective nuanced words in texts to be removed to the writer . Each generation is entitled to interpret history ( nation ) of his own . However , a new generation of this nation , who live in the imagination – globalism should be aware of , any nation-state in the world requires confirmation myths . Myth inauguration was not bad . He is an important element in the -there ‘s the ” glue ” of the nation. national hero , such as Prince Diponegoro , Sultan Hasanuddin , Sisingamangaraja XII , also TIB , and others are part of the inauguration of the Indonesian nation myth . Jeffrey Hadler in ” An History of Violence and Secular State in Indonesia : Tuanku Imam Bondjol and Uses of History ” (forthcoming in the Journal of Asian Studies , 2008 ) indicates , heroism TIB has been established since the early days of independence until the New Order era , related at least three interests . First, created the myth of the indomitable hero against the Dutch as part of the historical discourse of unifying the nation . Second, eliminating the discourse of Islamic radicalism in the nation-state efforts to create tolerant of religious and cultural diversity . Third, ” embrace ” ethnic Minang back to haribaan Indonesia , which has been a negative stigma in the eyes due to the events center PRRI. We’re not sure , been there a seed particle at the time of the struggle keindonesiaan TIB and other local figures who lived with her contemporaries , now known as a national hero . We also know that era of slavery is part of the social system and some of the traditional royal Nusantara territorial expansion by attacking a neighboring kingdom . Local leaders fought against the Dutch because it encouraged the spirit of regionalism , possibly backed by the desire to maintain hegemony as a ruler who gets rival due to the arrival of the West . However , they eventually became a national hero because the nation needs a unifying myth . It can not be denied , leaving the Padri War traumatic memories in the memory at once heroic nation. For about 20 years old the first war ( 1803-1821 ) that killing is a practical fellow Minangkabau and Batak Mandailing or general. Dutch intervention in the war marked by attack Simawang and Hard Water by army Captain Captain Dienema Goffinet and early April 1821 on the orders of the Resident James du Puy in Padang . Company involved in the war because ” invited ” the Customary . On February 21, 1821 they were officially handed over the territory darek ( inland Minangkabau ) to the Company in an agreement signed in Padang , as compensation to the Dutch who are willing to help fight the Padri . Part of the ” invite ” the rest of the family dynasty under the leadership of Sultan Pagaruyung Muningsyah who survived the killings by troops led by lord Pasaman Padri on SMART INVESTOR , near Stone Cage , in 1815 (not 1803 as mentioned Parlindungan , 2007:136-41 ) . However , since the beginning of 1833 the war turned into a war between the indigenous and the religious against the Dutch . Memorie Tuanku Imam Bonjol ( MTIB ) – transliterasinya by Sjafnir Aboe Nain ( Padang : PPIM , 2004 ) , an important indigenous source of the Padri War historians tend to ignore this long – note , how the two sides shoulder to shoulder against the Dutch . The parties initially opposed finally unite against the Dutch . At the end of remorse appears consciousness, inviting the Dutch in the Minangkabau people miserable instead of conflict itself . In MTIB , reflected a sense of remorse for the actions of the Padri TIB over fellow Minang and Mandailing . TIB aware , the struggle has deviated from the teachings of religion. ” The law is too Kitabullah Vast deck by us. How our minds ? ” ( As for many of the laws that already terlangkahi Kitabullah by us. How do you mind ? ) , write the TIB in MTIB ( p. 39 ) . TIB remorse and heroic struggle against the Dutch with their followers who surrounded Bonjol from all directions for about six months (March 16 – August 17, 1837 )- such as details of De Salis was reported in Het einde Padri Oorlog : Het beleg en van de vermeestering Bondjol 1834-1837 : Een bronnenpublicatie [End Padri War : Siege and Deprivation Bonjol 1834-1837 ; A Publication Source ] ( 2004 ) : 59-183 , may be taken into consideration for forgiveness for the errors and mistakes that have been done TIB . Now this nation that must determine if the TIB will be issued or derived from the ” litter of national heroism ” that had been ” paraded “by previous generations of this nation in their collective memory . ( Kompas 10/11/2007 By Suryadi , Lecturer and Researcher at the Opleiding Talen en van Zuidoost – Azië Culturen en Oceanië , Universiteit Leiden , The Netherlands ) . Rencong or Rincong or Rintjoeng is a weapon for the people of Aceh heritage and a symbol of bravery, courage, self defense and heroism of Aceh over the centuries. According to one source Rencong been known at the beginning of the Islamic Empire in the 13th century. Rencong age of the Kingdom of Aceh Darussalam is never out of nearly every waist (always tucked front dipinggang) of Aceh’s people on average have extraordinary courage of both men and women because it is for the people of Aceh rencong like soldiers with “bedil” symbol of courage, greatness, height of dignity and courage of people of Aceh so people must think portugal portuguese or length to approach this period Rencong Aceh.di people have levels that characterized the strata of society, to a Kings / sultan and queen / saltanat to sheath made of ivory and to dagger made of gold to get to the strata of society down to gloves made from buffalo horn or wood, and for dagger made of brass or white metal depending on their economic ability. Aceh as an important military power in the world Malays, with the weaponry that is very important. Because international relations with the western world, also began to follow the shape rencong development, particularly Turkey and the subcontinent India.Rencong also has similarities with the blade that is used by Turkish soldiers during the Turkish Ottoman sultan Mahmud empire and Mughal also scimitar than a few people with rapiers and style daggers (Caucasian language) that depend hanging from his belt in the hanging wall of Madras, India in 1610-1620. The Dutch sources refer to the weapons in Aceh in the 14th century. Examples of these weapons can be seen in the illustration of books in both Dutch colonial wars produced by the Center for Data Documentation and in Aceh in 1977. A popular magazine article stating that it invented the form rencong in Aceh in the 16th century at the time of Sultan Al Kahar, Sultan, who has close ties with the Ottoman Caliphate, when asking for help to attack the Portuguese. According to one source, too, In the 18th century literary hero People Pocut ordered Muhammad to make as much as much as rencong steel inventories are piling up, rencong can be seen at the Museum of Prague, the most valuable Ceko.Rencong from the 19th century with carved Arabic alphabet Jakarta is in the museum. In the Aceh expel the Portuguese from the whole soil and soil sumatra Malacca as well as the Dutch colonial period rencong a deadly weapon in addition to swords and muskets used in the battlefield, not only by the sultan, Admiral, Pang, Pang Sagoe, uleebalangs, Teuku Teungku Agam , Sayed, HabibCut Ampon, Cut Abang (the men) but also by Teungku Inong, Syarifah, Kak Cut, Cut Adoe, Putroe Cut, Cut Nyak (women). This weapon tucked in his waist before every man and woman of Aceh as a powerful marker of Might and height of dignity, and a symbol of self-defense, courage, greatness, and heroism as against the Dutch colonialists. In the struggle and the battle against the Portuguese and the Dutch, history records the names of the heroes and heroine Aceh, like Tgk Umar, Commander of Polem, Teungku Chik Ditiro, Admiral Malahayati, Pocut Meurah Intan, Baren Pocut, Cut Nyak Dhien, Cut Meutia, and Teungku Fakinah which does not release rencong from his waist. Rencong have meaning and Islamic religious philosophy, which berbetuk handle Arabic characters taken from the equivalent word Bismillah. Equivalent word can be viewed on a curved handle and then thicken at the elbow. Handle-shaped rencong BA, grasp the handle where a script SIN, which taper downward in the base metal near the handle is a script MIM, an iron base taper near the handle of a lane-lane erupai iron from the base of the handle until near the end symbolizes the character LAM, Section under the glove has the form of letters of HA, so that overall the letters “BA, SIN, MIM, LAM, HA”, reads the letters that form the structure of sentences Bismillah.Ini is a symbol that shows the characteristics of the Acehnese people who really cling to the glory of Islamic teachings. Rincong Meucugek: Why is it called rincong rencong meucugek because of the handle there is an cugek or meucugek (in terms of Aceh) as forms of archery and adhesives. Rincong Pudoi: In Aceh community means not perfect pudoi term alias is still no shortage. The downside can be seen in the form of the hilt rencong. Rincong Meupucok: The uniqueness of this Rincong shoots above the handle is made of carved ivory or gold. The base of the handle decorated with bamboo shoots pucok patterned gold / jewel ditampuk tumpal given handle, total length of these rencong approximately 30 cm. blades are made of white metal. Sheath is made from ivory and given a bond with gold. Rincong Puntong: The uniqueness of Rincong Puntong ng Punt on Hulu, with a dagger to be forged with metal, Rencong head of buffalo horn and scabbard made from wood. Rincong Meukure: This Rincong have differences with others on a given subject rincong specific decorations such as flowers, snakes, centipedes and the like. With the passage of time since the weapons Rencong Aceh joined with Indonesia until now slowly-slowly changing functions of this heritage becomes only suvernir goods or souvenirs and clothing complements traditional Acehnese groom. 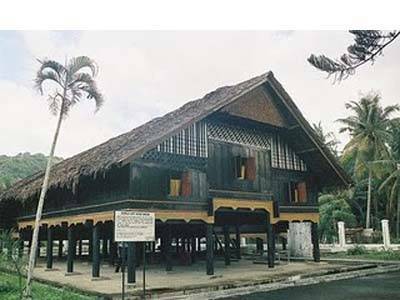 Hopefully, local government can save and preserve the assets of Aceh’s history over the centuries this precious, if it is not valuable heritage of Aceh will not be held with ACEH Tanoh RINCONG. Tjoet Njak Dien did not die in her own land or amongst her own people. She died as “Ibu Perbu,” which means “The Queen”, a name given to her by the local people in Sumedang, West Java. The local people never knew that this gracious and religious prisoner, bought to them by Dutch Soldiers on December 11th 1906, was, in fact, the famous Jihad Heroine of Acheh Province. Dien had fought the Dutch from the jungle for 25 years. We know from other modern studies, such as “The Rope of God” by Siegel (1969), how strong the spirit of Jihad is amongst the Achehnese. However, what that book does not reveal, is how the women are ready to join and lead in Jihad also. These are other heroine’s names that we are familiar with and our apologies for any others who have not been mentioned. (Keumala was an Achehnese admiral who Achehnese fleet to fight the Portuguese in Malacca). Dien, who was active in writing and delivering speeches on the beauty of Jihad, was born in 1848 into Achehnese nobility. Her father, Teuku Nanta Setia was an Uleebalang (commander, or literally, Sultan’s military officer) of VI Mukim of the Sagi XXV Military District. 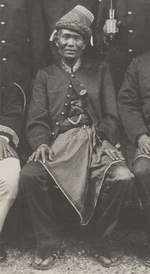 Nanta Setia’s ancestor was Panglima Nanta (Chief Commander), a descendant from Sultanah Tajjul Alam, an Achehnese ambassador (also a woman) for Pagaruyung Sultanate in West Sumatra. Dien’s mother was also from an Uleebalang family, the Uleebalang of Lampagar. Having married young (in 1862), to Teuku Ibrahim Lamnga, a son of Uleebalang of Lam Nga XIII, Dien soon realised, as the daughter and the wife of commanders of Army divisions, that she would have to farewell them when war broke out against the Dutch. Her two most beloved left her on March 22nd 1873, to fight Jihad and succeeded expelling the Dutch from Acheh. Even the Achehnese army succeeded in killing the Dutch Army commander, General Kohler, in the battle to defend Kutaraja, the Achehnese capital. She was happy to see them both back safe. On December 11th 1873, the Dutch invaded Acheh again, lead by General Van Switten. They had returned with a vengeance and 7,000 well-equipped infantrymen who managed to break the Achehnese line, on December 22nd 1873. Dien was parted from her husband and father for a longer period, this time. This second invasion was better prepared and better planned than the first invasion. The Dutch advanced carefully and in an orderly manner, until succeeding in capturing the capital. The Sultan was forced to leave the capital and began the guerilla war against the Dutch. Dien, this time, followed her father and her husband into the jungle. She sacrificed everything, her jewelry, her comfortable life and her health. Tragically, during the guerilla war, Nanta Setia, (her father) and Ibrahim Lamnga (her husband), were attacked heavily, surrounded and after fierce fighting, both were killed. 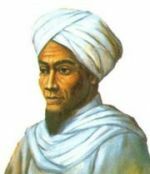 This battle is known as the “Battle of Sela Glee Tarun.” Most of the troops were killed also and it was thought to be due to a betrayal by Habib Abdurrahman. Participating directly, as she was, in Jihad, Tjoet Nyak Dien took over both her late husband’s and father’s army commands and led them in guerilla warfare from the jungle. She re-built these units and led them successfully. A far cry, from living like a princess, in VI Mukim. This is significant in the history of Muslimahs and which led to her eventual recognition as a National Heroine of Indonesia and indeed the entire Ummah. While leading these guerilla army units, she met another army commander from Meulaboh, West Acheh, by the name of Teuku Umar, who was one of Dien’s relatives. He was fascinated with her refusal to mourn her husband and father, because she said she should be happy that her two most beloved had reached the most noble status and died as a Shaheed in Jihad. They soon married and together led the two armies into a series of successful assault missions. Dien had one daughter with him whose name was Tjoet Gambang. Tjoet Gambang was to follow her Mother’s example. Some years later, after the destruction of Dien’s army, Tjoet Gambang married Teungku Di Buket, son of the most famous Ulama and guerilla leader, Teungku Cik Di Tiro. It is commonly thought that Tjoet Gambang died a martyr in 1910, two years after her Mother’s death in exile. Around 1875 Teuku Umar (her husband) made a strategic move, seen as a betrayal by those unaware at the time. Both of them came out of the jungle and surrendered to the Dutch. Their clever ploy was to lie to the Dutch, so when they came out of the jungle they said. Quote: “they realized they had done wrong so they wanted to re-pay the Dutch by helping them destroy the Achehnese resistance.” Un-quote. The Dutch were very pleased that such dangerous enemies were willing to help them. In gratitude, they decorated her husband with a Medal of Honor and called him “Teuku Johan Pahlawan”, which means the greatest hero. They also made her husband commander in chief of a Dutch army unit with full authority. They kept their plan a secret, even though they were continuously accused of being traitors by their own people. Their intention was to study Dutch strategy ,while slowly replacing as many as they could of the Dutchmen in the unit with Achehnese men. These Achehnese men were from their guerilla army units. When the numbers of Achehnese in this army were sufficient, Dien’s husband proposed a false plan to the Dutch, claiming that he wanted to attack an Achehnese base. Dien and her husband left with all of the troops and the Dutch heavy equipment, weapons and ammunition, never to return. This raised the ire of the Dutch and huge operations were launched to capture both Dien and her husband Umar. The guerilla army, however, were now armed with the best equipment stolen from the Dutch and returned its identity to the strategic guerilla army. They began to heavily attack the Dutch while General Van Switten was replaced, humiliated and disgraced. His replacement, General Pel, was quickly killed and the Dutch army was in chaos for the first time. Dien and Umar applied repeated pressure on occupied Banda Acheh (Kutaraja) and Meulaboh (her husband’s former base) and the Dutch had to continuously replace its Generals. The mighty guerilla army that was created, trained and led by this formidable pair, was successful. A gruesome history was to follow, however, when General Van Der Heyden was installed and never to be forgotten by the Achehnese. Brutal and bloody massacres of men, women and children in innocent villages took place, when the inhumane General Van Der Heyden engaged the “De Marsose” units. They were so savage that they were almost impossible to defeat. Most of the troops of “De Marsose” were Christian Ambonese. They destroyed everything in their path, including property and villages, as well as the people. These units caused even the Dutch soldiers to feel sympathy for the Achehnese, and eventually, Van Der Heyden dissolved the “De Marsose” units. These events may, however have paved the way for the following General’s success, as many people who were not involved in Jihad had lost their lives or their loved ones lives, their property or indeed all of their loved ones and property. Fear and grief may have then weakened the remaining broader population. General van Heutz exploited that fear and began to bribe local Achehnese to spy on the rebel army and act as informants. It wasn’t long before the Dutch soldiers found Dien’s husband and he was killed on Umar’s attack mission to Meulaboh on February 11th 1899. It was known as a betrayal by the informant named Teuku Leubeh. Tjoet Njak Dien’s husband, Teuku Umar’s death, left Dien alone again to lead the rebel army. Weakened then by advancing age, Dien, with her army, retreated further into the jungle. Trying not to mourn over her late husband, Dien continued to lead this rebel army, assisted by her army officers, such as Pang Laot Ali and Pang Karim. This army fought until its final destruction in 1901 and it consisted of men and women. Pang Laot Ali who felt sorry for Dien’s condition, hoped that the Dutch might give medical treatment for her. He deserted to the Dutch and bought the Dutch army into Dien’s camp in Beutong Le Sageu. They were completely caught by surprise and fought to the last man and woman except for Gambang and Dien. 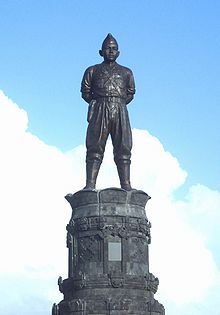 Pang Karim was said to be the last man to defend Dien with his sword until his death. Only due to her blindness was Dien captured and even then she held a rencong (a traditional Achehnese dagger) in her hand trying to fight the enemy. Her daughter Gambang, however escaped deep into the jungle, where it is known that she continued the resistance in the spirit of Jihad as her Mother and Father had done. There is little information to be found about Tjoet Gambang. Our humble apologies for being unable to provide more information than this at this time. Exiled by the Dutch, Dien’s arrival in Sumedang in her worn out clothes and accompanied by other Achehnese political prisoners, naturally drew the attention of the Regent Suriaatmaja as a faithful Muslimah. The male prisoners demonstrated obvious respect to this small, old lady, but the Dutch soldiers were forbidden to reveal the identities of the captives. See insert photograph, page 1. Due to their obvious deep religious nature, especially Tjoet Njak Dien, they were placed with the local Ulama, named Ilyas. Ulama Ilyas quickly realised that his guest, who could not speak their language nor them hers, was indeed a scholar in Islam and became known as “Ibu Perbu”(The Queen). Her sound Islamic knowledge and her ability to recite Al-Quran beautifully earned her the invitation to instruct on Islam. “Ibu Perbu “or Tjoet Njak Dien taught Al-Quran in Sumedang, West Java, until her death on November 8th 1908. She was buried as “Ibu Perbu” in the cemetary of Sumedang’s nobility in Gunung Puyuh, in the outskirts of Sumedang. By 1960, those Sumedang locals who could have recollected who “Ibu Perbu”was, had passed away. However, information came from the Dutch Government based on official letters in “Nederland Indische”, written by Kolonial Verslag, that Tjoet Njak Dien, rebel leader from Acheh Province, had been placed in exile in Sumedang, West Java. There had only ever been one Achehnese female political prisoner sent to Sumedang. It was realized then, that”Ibu Perbu”was in fact Tjoet Njak Dien, “The Queen of Jihad” and was then recognized by President Sukarno as a National Heroine. A small Achehnese Mosque (meunasah) was built near the cemetery in her memory. 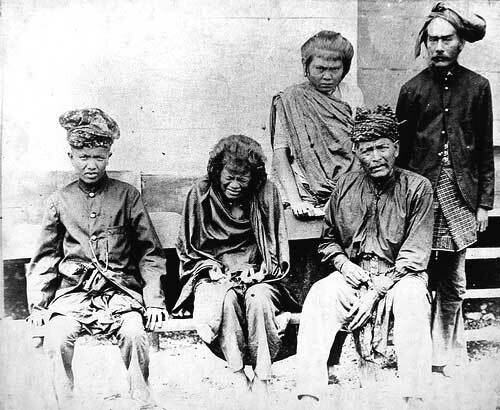 Cut Nyak Dhien second from left in captivity. Teuku Umar (born in 1854, Meulaboh; died February 11, 1899) is a Pahlawan Nasional Indonesia (National Hero of Indonesia). He led a guerrilla campaign in Aceh during the period of the Dutch occupation. He fell when Dutch troops launched a sudden attack in Meulaboh. His body was buried in the Mugo area. After Teuku Umar’s death, his wife Cut Nyak Dhien continued to led guerillas against the Dutch. I Gusti Ngurah Rai of Bali is a National Hero of Indonesia. The title of National Hero of Indonesia (Indonesian: Gelar Pahlawan Nasional Indonesia) is awarded by the government of Indonesia to people considered to have made a significant contribution to the fight for independence or the development of the nation. The tradition of officially naming people Indonesian National Heroes began in the time of President Sukarno. The first person awarded the title was Abdul Muis via Presidential Decision No. 218/1959 issued on 30 August 1959. As of the beginning of 2009, 143 people had been named as National Heroes. The first set of criteria for a national hero was set out in Presidential Decision No. 241/1958. It defined a National Independence Hero as “a person who throughout his/her life, because of love for the nation did great service or led an organized activity to oppose colonialism in Indonesia, fighting enemies from overseas, or who did great service in the area of politics, statesmanship, socio-economics or culture by fighting for independence and the development of Indonesia”. This was refined in 1964 in Presidential Regulation No. 33/1964. This defined a Hero as somebody who died in action or as a result of heroic acts fighting to defend the nation or who although not killed at the time, was proved to have made sacrifices defending the nation and whose subsequent life was unmarred by any actions that detracted from his or hr heroic status. This definition has been used without any major changes since 1964. Herman Johannes, (1912–1992) an Indonesian professor, scientist, and politician. 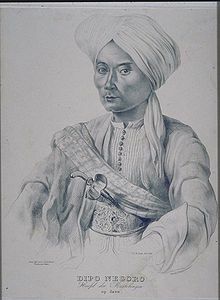 Singawangsa (1775-1778) Fought against the Dutch in Java. If you’re like many people, at the beginning of every year you resolve to get your finances in better shape by paying off debt and adding to your savings. But like many resolutions, the reality often doesn’t meet the goal. All is not lost. There are still five full months left in the year — time for a quick review of simple ways to save. The goal? To set aside at least an extra thousand dollars by Christmas, without sacrificing your quality of life. Going on a “dollar-diet” is no way to get the job done — painless savings are the only kind you should attempt because they’re the only kind that work. 1. Lower your cell phone bill. Potential savings: $100. If you’re not using minutes you’re paying for, switch to a cheaper plan. That could save you $20 a month, or $100 by Christmas. 2. Lose your land line. Potential savings: $140. If you find that your land line is gathering dust, lose it. And even if you want to keep your land line, if you have a broadband internet connection, get your phone service through it rather the phone company. A service like Magic Jack will give you unlimited calling for $2/month rather than the $30 you might be paying for traditional phone service providers. 3. Staycation instead of vacation. Potential savings: $1,000+. The savings from staying home vs. traveling for vacation are obvious. The trick is to maintain your quality of life while you do it. No working allowed. Turn off the computer and the phone. Relax, have fun, and take day trips exploring your local area. 4. Raise your insurance deductibles. Potential savings: $250. Raising your car and home insurance deductibles could have zero impact on your quality of life, but it could have a big impact on your savings. Decide what you can afford to pay out of pocket, spend a few minutes on the phone and see what you can save. Another way to save: shop your insurance and see if you can get a better deal. 5. Drop the gym. Potential savings: $150. Unless you’re training for competition, a gym can be expensive overkill. You can buy cheap weights at yard sales or places like Play It Again Sports. Better yet, find them free at sites like craigslist or Freecycle. You can buy cheap workout videos and exercise in front of the TV, or get both exercise and fresh air by walking, jogging or biking in your neighborhood. 6. Drop premium cable channels — or drop cable altogether. Potential savings: $50 – $600. One of the most popular stories we’ve done this year was “You Don’t Have to Pay for Cable,” a step-by-step guide to bypassing your cable company while still watching your favorite shows. Even if you decide against that, however, consider dropping premium channels. They’re expensive and often filled with lousy fare anyway. 7. Sell Stuff. Potential earnings: $400+. If you’re like most people, you’ve got clothes you don’t wear, CDs you don’t listen to, books you don’t read, DVDs you don’t watch, furniture you don’t sit in — you get the picture. Take it to a consignment shop or a swap meet; sell it online at eBay (NASDAQ: EBAY – News) or craigslist; have a yard sale. If nothing else, donate it and create a tax deduction. But don’t mess up your quality of life by stressing out and trying to do everything at once. Pick one thing (or room) every month from now until the holidays, clear out the clutter and make some money! 8. Save on Food. Potential savings: $300+. The web is full of tips to save on food. Some will be obvious (use a list), but some might surprise you. For example, did you know that you might find groceries at 50% off at a salvage grocery store? 9. Haggle. Potential savings: $500+. According to this survey by Consumer Reports, negotiating a lower price is not only possible, it’s likely. What can you negotiate? Pretty much everything. You can call your credit card company and ask for a better interest rate. You can ask for a lower price from your doctor. You can negotiate a lower price on your cable bill. The fact is, you can negotiate a lower price on anything from home electronics to hotel rooms. 10. Carry only cash: Potential savings: $250+. Try an experiment between now and the holidays. Carry only cash — no plastic. This simple idea can easily result in major savings. 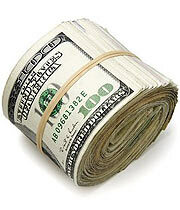 The reasons are simple: If you carry only the cash you need to buy what you went out for, you’ll avoid impulse buys. Plus, it’s psychologically more difficult to spend actual money than “plastic” money. Combine those ideas and you’ll have at least an extra $1,000 by the time the holidays roll around. And if you need more ideas to make it work, the web is overflowing with hundreds, if not thousands, more. The key is to carve out a little time, check out some resources, decide what you’re willing to try, and get on with it. But remember to avoid anything that might make your life less enjoyable. The key to making it is making it easy on yourself. So if you want an extra grand by the time the holidays roll around, start today! Yeah whoever wrote this article needs to get with the program. I don’t see what the big deal is. Most people can get great deals online, but people talk about buying online hurts our local economy. Does anybody think the prices are up locally – and expect us to still be able to afford them? I goto different grocery stores to get different prices on different things. You just need to be more aware of the things around you. Also a part-time online job is very possible these days. No joke, my company empowers 600 clients at the moment. They all pay a monthly fee, but earn from what we teach them. Not every online job/opportunity is a lie.